Removing the unwanted hair with common method such as waxing is usually painful especially if the hair is coarser. With the laser hair removal treatment, the procedure is less painful than waxing. Xemos might be the device you are looking for. 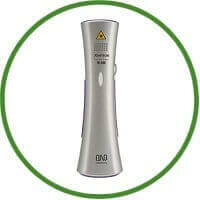 You can use it from your home with more privacy, no need to go to a clinic to get your unwanted hair removed. You can use it only a second or a half second not more than that or else you can get your skin burnt. Xemos is CE Certifies, which means that it is certified safe for consumer use and safe for health and environment.